at some point mid-december, hubs and i got hooked on granola. we ordered every time we came across it on the brunch menu, eschewing our usual pancakes, eggs or french toast. and then i decided that we should eat granola for breakfast at home as well . . . and have been fiddling with recipes since. over the weekend, i baked a batch of honey granola included in rose bakery’s cookbook. i turned out pretty swell, and i like how she includes a touch of wheatgerm in the mix. hubs and i pair our granola with the greek gods honey-flavoured greek yogurt — one of the tastiest yogurts i’ve come across of late; the honey flavour isn’t overpowering and sometimes when i’m craving a strong sweet, i’ll squirt a bit of honey or stevia on top of it all. the recipe makes enough to fill a ziploc gallon bag, which is how i usually store the stuff. it lasts us about 1-2 weeks, with harry snacking on some in between as well. for the picture, i poured some of it into a shallow bowl because . . .well. . . it looks more appetizing in a bowl than plastic bag. never bake the dried fruits, i.e. raisins, dried cranberries, dried apricots, dried cherries. the baking process further dehydrates the already dried fruits, making them um well inedible post baking. 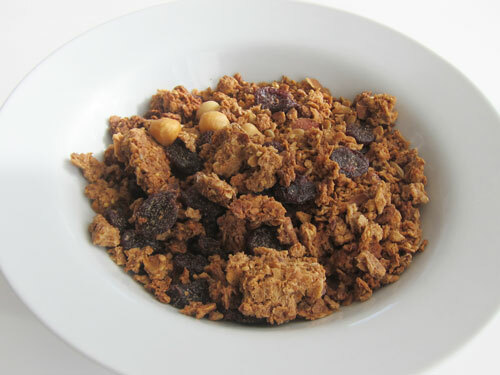 rather, the dried fruits should be mixed into the granola, after it has been removed from the oven. when using larger pieces of nuts, like hazelnuts or whole pecans, i’d advise crushing them with a mallet first and before baking. the aromas are better released that way and the smaller pieces form a more harmonious melange with the rest of the mix. Pre-heat oven to 275ºF. Line a baking sheet with parchment paper and set aside. In the bowl of your standmixer fitted with the paddle attachment, pour in oats, nuts and wheatgerm. Stir on lowest speed until integrated. Next, pour oil, honey, water, sugar, vanilla, cinnamon and salt into a saucepan. Bring to a boil, stirring constantly. With the mixer on slowest speed again, carefully pour in the hot liquid mixture. Add a bit more oats if too wet — there shouldn’t be any excess liquid on the bottom of the bowl and the resulting granola at this stage will be sticky. Spread it out on the baking tray. Bake for 60-90 minutes, making sure to stir the granola every 20 minutes or so. The granola is ready when it’s a rich golden brown. Remove from oven and let cool. When cool, transfer to a gallon size plastic bag. Pour in dried fruits and shake the bag until evenly distributed. This entry was posted in Granola and tagged granola, honey granola recipe, Paris, rose bakery, the greek gods honey flavor greek yogurt. Bookmark the permalink. I just ordered the Rose Bakery cookbook recently featured in the February issue of Martha Stewart to make this granola.